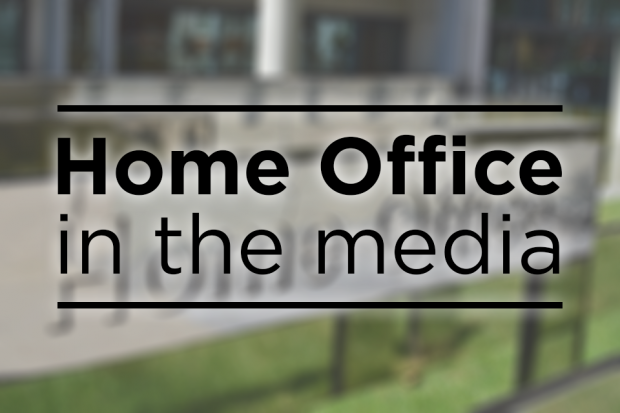 Today’s Home Office-related coverage includes a report by the National Crime Agency into modern slavery and the gender pay gap reporting. The BBC, Mail, Telegraph and Times report on findings from the National Referral Mechanism Annual Summary 2017, published by the National Crime Agency (NCA) today. Among the findings include the number of potential victims reported to the National Referral Mechanism (NRM) increased by a third in 2017 compared with the year before and British nationals were the largest nationality recorded. In the coverage, the NCA made clear that the increase was in part due to a rise in ‘County Lines’ gang exploitation referrals. Modern slavery and trafficking are despicable crimes which see some of the most vulnerable people in society targeted by ruthless predators. This Government is leading the world in our response to this horrendous crime – through the Modern Slavery Act 2015 giving law enforcement the powers they need to pursue offenders and working to bring this issue out of the shadows and increase awareness among police, front line workers and the general public. These figures show that more potential victims are being identified and protected thanks to a greater awareness and improved understanding of modern slavery. We are also beginning to see the operational results of the renewed focus on modern slavery, with over 600 live police operations underway, and the first conviction of county lines gang members under the Modern Slavery Act. But we know there is more to do, and we are working to improve the system for identifying victims and supporting them to leave situations of exploitation and begin to recover and rebuild their lives. If journalists need further guidance on our action to tackle modern slavery, please do contact the press office. The Guardian carries an interview with the chief executive of the Equality and Human Rights Commission, Rebecca Hilsenrath, who said she will pursue companies who fail to report their gender pay gap. The paper says that while 3,700 have reported, nearly 5,300 have not. The paper says that Ms Hilsenrath said those that fail to make the deadline on 4 April “can’t row back” and would be named and shamed.